Bearish engulfing candlestick pattern on the weekly chart. The previous post of the chart analysis for Suncor was based on the daily candlesticks. This analysis is based on the weekly chart and shows the same information from a different viewpoint. Current support is at the 40 to 50 day moving average with major support at $40. 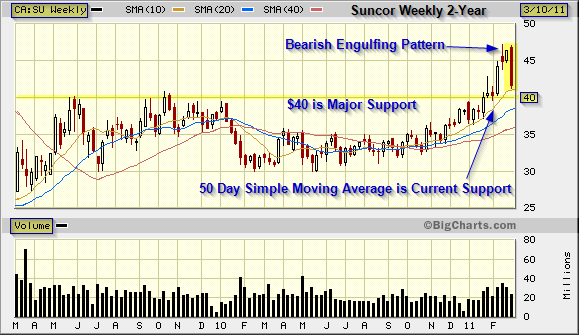 We do not want to see Suncor close below support at $40.00. This is not the best looking chart over the two-year period: the major trend has been sideways. Fundamental data for Suncor to complete your evaluation of this TSX listed stock. Some of the other Canadian stocks that have been featured include: Encana, Precision Drilling, Riocan, BMO, Shoppers Drug Mart, and BCE. Note: This technical analysis is for educational purposes so you can learn to trade online using candlestick charts. Please conduct your own chart analysis or consult your financial advisor before making investment decisions. The chart snippets are from BigCharts.com which I recommend and have used for fifteen years. This entry was posted in Stocks and tagged bearish engulfing pattern, candlestick charts, Suncor, support, TSX on March 11, 2011 by Trader.